The month old gamble of Mr. Modi (November 2016) has put the whole country in an unprecedented chaos. The demonetization of 86.4% of the circulating currency in the form of Rs 500 and 1000 rupee notes has put into jeopardy the life of major sections of society. 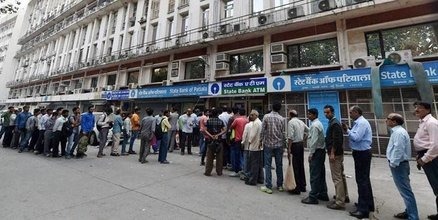 Nearly seventy people have died in the queues to withdraw the money from Banks/ATMs. The daily wage workers have to lose their daily earning to withdraw the cash, many daily wage earners had to go back to their villages for lack of work, the small trade has been damaged severely, farmers are neck deep in trouble while probably those holding the ‘black money’ don’t have to suffer such an ordeal. The 80% of estimated black money is stashed in the overseas tax heavens; roughly 15% of such wealth is in the form of real estate, gold and shares etc. Its only 5% of money which is in the form of currency notes. It is for this 5% quantum that 86% currency has been demonetized and millions of people, who barely make their two ends meet, have been put to such a massive discomfort. The impact of this is that the hard earned money of the peasants and common people in the cooperative banks, agricultural credit societies, housing societies and so on has been frozen in a single stroke. The agricultural-rural economy is close to paralysis. The massive loans of corporate houses have been labeled as ‘Bad loans’ and have been waived off. All these expose that the true intention of this assault is not eradication of black money, but to unleash a social engineering for draining away the meager earnings of the common people in to the coffers of corporate billionaires through the banking system. This move has full backing of those who deal with black money or those Corporate giants who stand to benefit as their loans are being waived off. The response to this has been very diverse. Most of those standing in long queues have expressed their opinions though their life and sweat. While few among them have also praised the effort by saying that in the long run it will be better for them. Most of the opposition parties though disunited as usual have vehemently criticized the move of the government. Prominent economists and substantial section of media have scathingly criticized the move of the government. The critics of the Modi policy, again as usual are being labeled as anti Nationals. Baba Ramdev, the fellow traveler of Modi politics used the word ‘Deshdrohi’ (anti national) and RSS groomed Devendra Fadanvis, the Chief Minister of Maharashtra, used the word Deshvirodhi (against the nation) for these critics. The large section of followers of Modi mania, despite their discomforts are holding that it is a good move. Their delusion is that in the long term the system will be better and they will benefit. Modi launched an app to conduct the survey to show that people’s opinion is with him, while few surveys are showing growing resentment against this move. It’s no mystery as to why this must has been undertaken. Two major Gujarati papers had carried the news of demonetization several months ago. Many are arguing that it is to cripple the opposition parties in the forthcoming elections in UP and Punjab in particular. The idea is to reduce the campaigning capability of opposition parties. There are reports that BJP has lots of real estate just prior to demonetization. The problem of ‘bad loans’ given to the corporate are being aimed to be solved through the public funding for Corporate giants through the banks, through the massive deposits which is the goal of this move. Modi campaign for power in 2014 was built around the promise of Acche Din and bringing the black money from overseas banks and then depositing of 15 Lakhs in every body’s account. The social scenario has worsened abysmally during last two years. The prices of commodities reached sky high during this period. Tur dal has shot up from Rs. 60 to 150 per KG. Despite the drastic fall in the prices of crude oil in international market from 119 per barrel to 30 per barrel, the petrol price in India has come down only from Rupees 67 to 60 or so only. Corporates like Mallya have made merry by running away with huge debts. This along with the non realization of boastful promises like rupee becoming stronger viv a vis dollar are nowhere in sight. The agrarian crisis has been worsening. With the demonitisation the production in unorganized sector has come to a near halt. It seems Mr. Modi, taunted by opposition and critics on his boastful promise, now wants to claim that so many efforts are being done in this direction. As such the major area of non taxed money remains untouched. There is a push towards cashless economy where large number people seem to be unprepared for that. During last over two and a half years the so called fringe elements of RSS combine, Modi’s ideological pond; has become bolder and has thrown up non issues, identity related one’s in the public domain. These emotive issues which took off from the Ram Temple-Babri Mosque dispute have been joined in by issues related to Holy cow, beef, pseudo nationalism Bharat Mata ki Jai, abolishing the autonomy of education institutions, creating a growing atmosphere of intolerance leading to returning of awards by eminent writers and social workers has come to the fore. The deeper issues related to poverty alleviation, employment, malnutrition, health and matters pertaining to agrarian crisis have been buried under the weight of pseudo nationalism. This hyper nationalism has also worsened the state of affairs in Kashmir and relations with neighbors; with Pakistan and Nepal in particular. This seems to be a move which will benefit the corporate World and is creating huge suffering for the average people. The propaganda, ‘this will benefit us’ has been created with great amount of success. But can this deceptive propaganda win over the reality for so long?